A team of eight senior and mid-grade officers from the Lebanese armed forces traveled to Tampa, Fla., in August to assess the newest vessel for the Lebanese Navy. 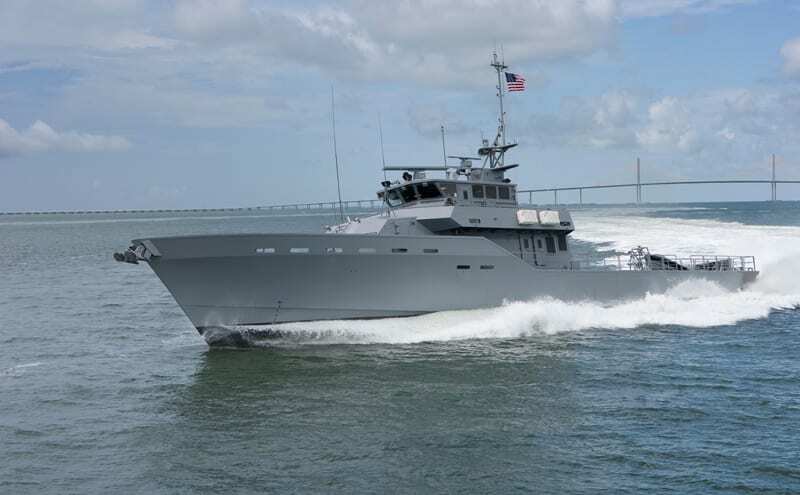 The LCSC 42 (Lebanese Coastal Security Craft) is a 43.5-meter fast patrol vessel, first of a new class of advanced multimission platforms built by U.S. shipbuilder RiverHawk Fast Sea Frames (RHFSF), according to a release from the company. The team of officers, led by Lebanese armed forces Gen. Elias Bwari, arrived in mid-August to assess what will be the most technologically advanced craft in the LAF navy’s fleet. The team included key technical ratings necessary to man the ship, as well as the pre-commissioning unit’s commanding and executive officers. Provisionally named Trablous, the vessel was contracted 19 months ago by Naval Sea Systems Command (NAVSEA) to Maritime Security Strategies (MSS), like RiverHawk, based in Tampa, Fla. RiverHawk produced and outfitted the 43.5-meter, 265 metric ton ship based on its proprietary ship design. Provisionally named Trablous, the vessel was contracted 19 months ago by Naval Sea Systems Command (NAVSEA) to Maritime Security Strategies (MSS), like RiverHawk, based in Tampa, Fla. RiverHawk produced and outfitted the 43.5-meter, 265 metric ton ship based on its proprietary ship design. Preliminary technical briefings and discussions led to system and equipment light-off and operation, and a subsequent underway performance demonstration. Also aboard were NAVSEA (PMS 325) and supervisor of shipbuilding (Gulf Coast) representatives, in addition to Royal Canadian Navy Commodore Gilles Couturier, director of the Building Partner Capacity Directorate at U.S. Central Command (CENTCOM) and CENTCOM’s Coast Guard Security Assistance Officer Cmdr. Ben Berg. Launched in January, the ship has undergone a series of rigorous, comprehensive tests and trials. LCSC 42, contracted under the U.S. Foreign Military Sales (FMS) program, is intended to improve Lebanon’s ability to monitor and patrol its territorial waters and contribute to international maritime security efforts in the Eastern Mediterranean. The ship is expected to be shipped within weeks and possibly be delivered to the Lebanese in October. MSS’s General Managing Partner, Rear Adm. Robert Cox, USN (Ret. ), said the MSS/RiverHawk Team was honored to support United States, Lebanese, and international security objectives in the Eastern Mediterranean and the CENTCOM area of responsibility. “This particular design and the engineering and electronic systems we have incorporated should be ideal for the missions and tasks that Lebanon and its international partners rely on the Lebanese Navy to execute in that region,” Cox said. “MSS and RiverHawk teamed up to provide a high quality, cost-effective fast patrol boat,” Cox said. “The primary product line – the ‘AMP’ – is underway today as the LCSC 42. It incorporates new designs and features that deliver significant cost and performance improvements over other ships similar in size and capabilities. A key attribute for any Navy or Coast Guard is that the AMP is designed from the keel up to be rapidly and affordably configured depending on diverse customer mission requirements.” Company officials did not say what armament the vessels will carry in Lebanese service, but they are designed to allow the incorporation of a wide range of capabilities and weaponry. The epoxy resin hull, easy and inexpensive to repair and maintain, is also very strong but lightweight, Riverhawk says. The strength of the composite construction allows the deletion of many of the standard stiffeners and supporting structures that add weight to conventional vessels. Weight reduction translates directly into greater speed, increased maneuverability and lower fuel consumption (lower cost and better performance). Two MTU 20V 4000m93L diesel engines, coupled to HamiltonJet HT-1000 water jets, power the LCSC 42 to more than 28 knots. Range at 11 knots is more than 2500 nautical miles, and endurance is stated as five to seven days. Crew complement can range from as few as six up to 22 personnel, and the ships are highly automated. The LCSC 42 uses onboard sensing of systems such as engines, environmental sensors, navigation, and weapons status. An integrated bridge system (IBS), designed according to the ABS-NIBS Guide for Bridge Design and Navigational Equipment/Systems as well as ABS HSNC and SOLAS classification, eases crew workload. The IBS was provided and commissioned by Raytheon Anschutz GmbH, and incorporates four wide-screen multifunction workstations for navigation and surveillance, conning and other operational, command and control functions. Crew complement can range from as few as six up to 22 personnel, and the ships are highly automated. The LCSC 42 uses onboard sensing of systems such as engines, environmental sensors, navigation, and weapons status. An integrated bridge system (IBS), designed according to the ABS-NIBS Guide for Bridge Design and Navigational Equipment/Systems as well as ABS HSNC and SOLAS classification, eases crew workload. The IBS also incorporates “the ship’s automation system, a closed circuit television system, and a forward-looking (FLIR) thermal imaging camera,” according to RiverHawk. “Surface search X and S-band radars programmed to automatic radar plotting aid (ARPA) software, a full package of navigation sensors, data management software, global maritime distress and safety system (GMDSS) A3 and all other electronic and safety equipment complete the IBS and command and surveillance package on Trablous,” according to company materials. RiverHawk is also under contract to NAVSEA to deliver two 60-meter command and Offshore Support Vessels (OSVs). 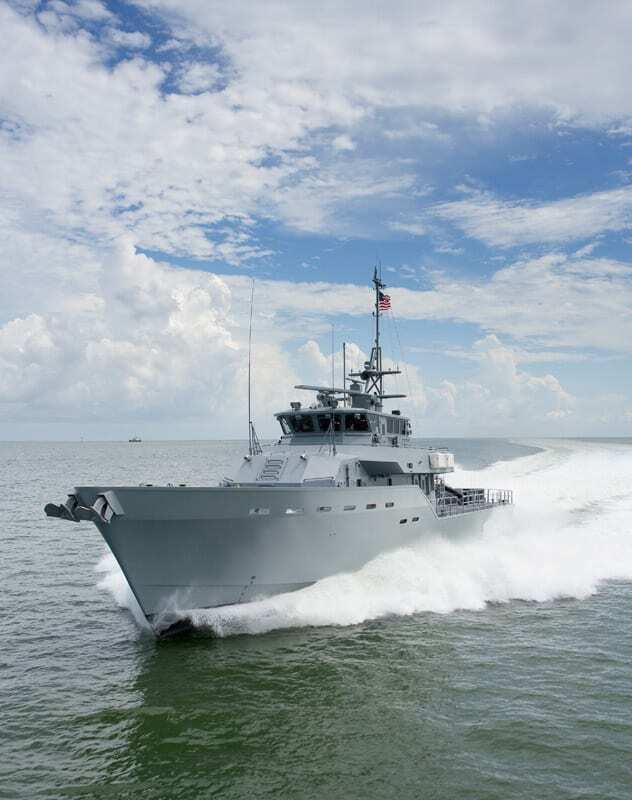 The OSVs are being built by RiverHawk in a partner facility in Houma, La., on a design and production schedule very similar to the schedule for the LCSC 42. The first of RiverHawk’s two OSVs was delivered to the U.S. government in July 2012. OSV number two was scheduled to begin trials in late August. Both ships are scheduled for shipment to Iraq early this fall.